Welcome back to Moodboard Monday! Here is this weeks Moodboard! Here is my interpretation; I decided to add some purple into the mix because I love purple and orange together! The first thing I did was print out a fun witch silhouette, I cut it out, traced around it and filled in in with some resist medium. For the background I sprayed my journal page with some water then dropped grey, purple and some white shimmering ink onto the page. I used a paper towel to soak up the extra paint! 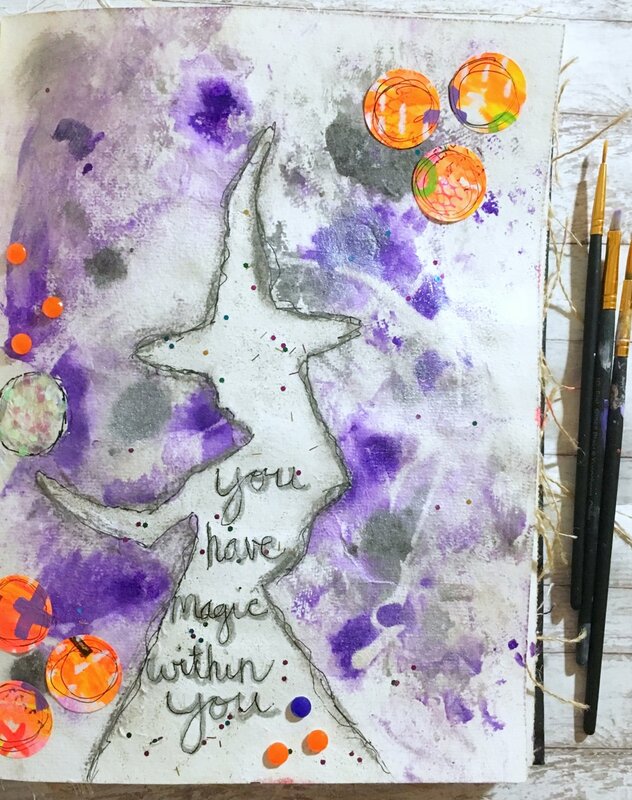 I painted bits of glitter with some glitter paint throughout the page and went around the Witch with some pen and chalk pastel. I added some home made stickers, gems and more glitter and then wrote in the quote! It was such a fun Halloween page without being super Halloweeney lol! Thank you again for checking out my interpretation of this fun Moodboard! Please check out Samie’s page as well! Tag me on Instagram if you decide to play along! Happy Halloween!